Bio: A robot policeman dispatched from Cybertron to an Earth police facility through an interplanetary talent exchange program. Cooperating with human partners, every day he devotes his efforts to the safety of his region. Unsophisticated and kind-hearted, he cracks down on vicious crimes with a firm manner. Now and then he'll conflict with the locals or his co-workers owing to differences in culture or moral concepts. Clampdown carries an automatic handgun and 'Flashbang' grenade launcher. Wow. What an exciting bio. Just the sort of uptight blank-face good guy that decorates many a Japanese Anime. Moral of the story: it's good to be boring? 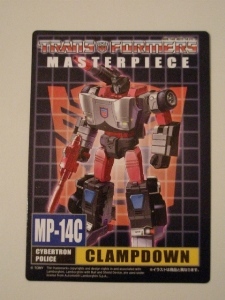 I've never read Clampdown's bio before, despite owning the 2003 E-Hobby figure. I just thought he looked nice and had him pegged for working as part of whatever Cybertronian police force had Prowl on board. How exactly is a 30 ft robot going to help with law enforcement on Earth? Stamping out crime, I guess. Can't imagine the human exchange person faring so well on planet of the giant space robots. 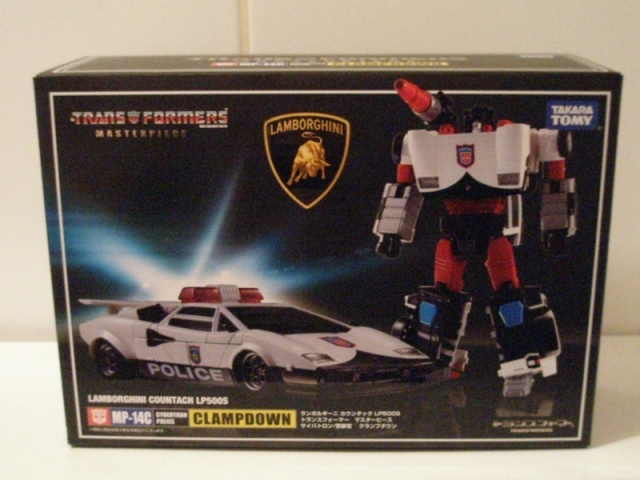 Anyway, Clampdown is a quick bit of cash-grab for the Lamborghini Countach Masterpiece mould before Takara loses the license or something. 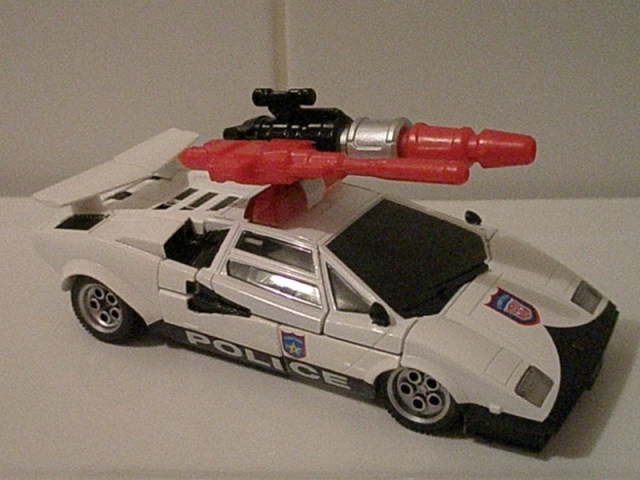 The figure has his origins in Takara's own Transformers pre-cursor Diaclone, where a number of their transforming mecha had a light bar slapped on to pass themselves off as a police car. 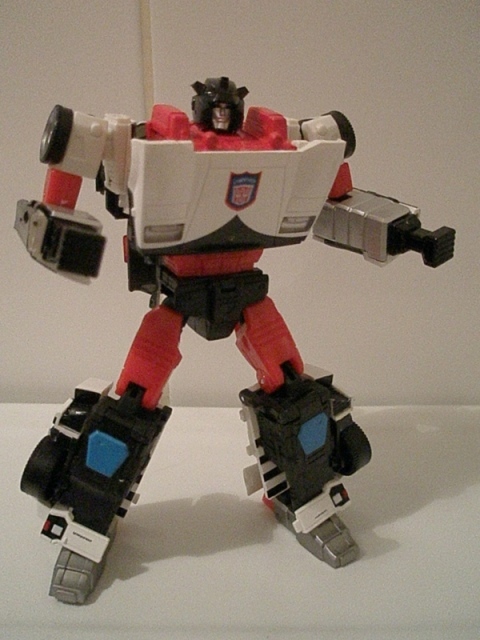 The emergency variant of the Countach made its way to Transformers as Red Alert, and as he's had a, er, a few Masterpiece toys, so Clampdown gets one by osmosis. I liked the E-Hobby figure very much, but there's no denying that next to Red Alert's Fire Department livery, Clampdown just didn't look mental enough to carry off being a police car. The colour scheme just didn't shout its purpose loud enough to carry it off. Here though, with an increase in size and scale, Clampdown seems to hold his own on the sports car as an emergency services vehicle gig. Maybe it's familiarity with the look after 13 years, but mostly I think it's because more of the red of his palette is visible at this scale. It really helps break up the monotony of his police livery in robot mode and gives him some presence and less like Red Alert's poor relation. Proportionally, he looks great, and oddly, I've not found his chest looks too wide as I did with Tigertrack. Must be a trick of the colours. 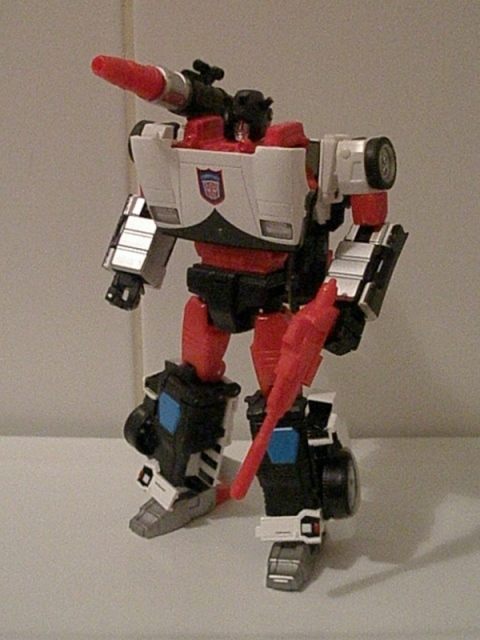 To help set him apart from the regular flavour Countach herberts, Clampdown also features some faux-wheels on his shoulders. Normally, I'm not a huge fan of these 'cheat' details, but I actually like them here, just because the effort's been made to tart them up with some paint. Can't say as I'm much of a fan of the red rifle though, doesn't do much for looking like a realistic firearm. He also comes with a couple of pile drivers for breaking down doors in pursuit of criminals and such. Probably. 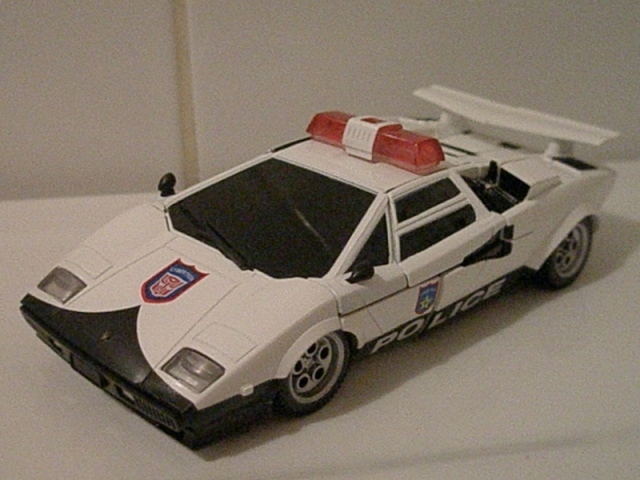 It's a police car Countach! It looks pretty sharp, I have to say, despite the join lines. The black and white paint job looks superb. As he's rendered totally in plastic, there's none of the usual paint matching problems that the inclusion of die-cast can bring. Whilst it's not massively convincing as a police car, it does look pretty awesome, although I would have preferred blue lights, or a mix of blue and red. Suppose that's not as realistic to the Japanese police livery this thing is aping, but realism be damned. Since when have the police used Lamborghinis anyway?